i'm excited to introduce my next guest! i *met* cara on twitter, where she does an amazing job hosting talkin' tuesdays. if you've never joined in the #talknt fun, you should check it out this tuesday night! she also has quilt patterns for sale at fat quarter shop - avalanche is my favorite! welcome cara!! Hi everyone! I'm very pleased that Tammie asked me to come and be a guest blogger during her Valentine's week of fun! Come and join me over at CaraQuilts, and make sure to check out the Basics Charity Challenge which is going on RIGHT NOW! You can win some great prizes and help out your own community! Valentine's Day can be a lot of fun, especially with kids. Any excuse to decorate and play with different materials is good in my book! My love story isn't particularly exciting or romantic, in fact I'm not sure my husband knows the meaning of the word, but it's ours. Over 8 years ago Shane and I met online. We talked for months before meeting. After back and forth visits, in which both our mothers were assured that neither of us was an axe murderer, we got engaged and Shane moved from the mountains of North Carolina to the Thames Valley of southwestern Ontario in Canada. You want exciting try doing immigration forms! That will take the romance out of any relationship! But that doesn't change the fact that I like the kids version of Valentine's Day, making cards and decorations, wearing pink, red and white. And getting some sugar from my Valentine. 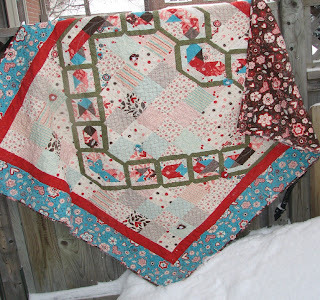 Last year I made this quilt using Giddy, the pattern is available at Moda Bake Shop. One of the reasons I love this quilt is because even though it's a heart etc its not sugary sweet, and the green "ribbon" reminds me of all the things that hold my heart together and that I wrap in love. This year I wanted my daughter to be able to help so we made fabric heart garlands! Super easy, all you do is fuse two layers of fabric wrong sides together and cut out shapes. We made hearts. The front and back can be the same or different fabric. Whatever floats your boat. Because I wanted to make it so Little Bit could do it with her friends we used the glue gun and glued the hearts onto a piece of ric rac. One made a vertical and another did a horizantal. If you make them smaller they'd be great hung from a chandelier or light fixture above the table. Using a clover heart yo-yo maker I made one yo-yo, grabbed one of the fused hearts, buttons and some ribbon, and made up a cute little hair clip for Little Bit to wear this week. With a braid that measures 45cm (about 17"), she could probably go with more then one! Holiday decorating or crafts with kids don't have to be expensive or complicated. With your basic glue gun, some buttons, ribbon and fabric you can make just about anything! Grab some fabric and have fun! Love that quilt Cara:) Cute hair bows too---what a great idea on a budget! Great Post Cara. I think your story s very sweet and romantic!